19.3CM 18C Kangxi Blue White Batavian Bowl Chinese Antique Porcelain Qing. 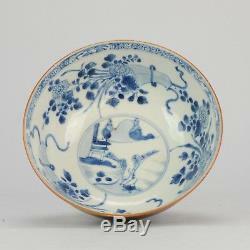 Interesting and fine painted Chinese porcelain bowl. Rare to find a batavian item of this size! With a very superb scene of flowers in vase. Early 18th c Export from the Kangxi / Yongzheng period. Now often called Batavian ware after the port city of Jakarta/Batavia in Indonesia used by the VOC to acquire huge quantites of Chinese porcelain. VOC imported these works of art due to their huge popularity. Great, but small rimfrits, 1 chip and 1 hairline. 18th century Qing (1661 - 1912). We can not control this. For China (& rest of Asia) & US allow at least 2 to 3 weeks. Depending on the situation it can take up to 1.5 month. This also influences the tracking data shown online. You can follow it at. The item "19.3CM 18C Kangxi Blue White Batavian Bowl Chinese Antique Porcelain Qing" is in sale since Thursday, May 5, 2016. This item is in the category "Antiques\Asian Antiques\China\Bowls". The seller is "theceramics_and_collectibles" and is located in Amsterdam. This item can be shipped worldwide.